Unwanted hair can often be found in areas around the chin, breasts or chests, knuckles, upper lips and on other areas of the body. It can be caused by age, hormonal imbalances and from various other causes, and can result in altered appearances, discomfort and embarrassment, especially when the hair is prominent and dark in color. Tweezing can be a tedious process of hair removal that can also be painful, and that can sometimes result in a minor rash at the site where the hair follicle was removed. The process can also be cumbersome and difficult to perform. Depilatory creams can work well temporarily, but can cause harsh chemical reactions, such as burns and raw, painful rashes. They take a considerable amount of time to use properly, and some involve applying a second cream to neutralize the first. Depilatories can be dangerous to use around the eyes, nose and mouth areas, and caution should be exercised in not leaving them on the skin for too long. Hot Wax can be an effective method of hair removal, but is noted for being as painful and expensive and it is ONLY temporary. Shaving provides a fast, easy solution to hair removal, but can also lead to denser hair regrowth, and physically thicker, darker hair follicles. A large number of medical laser systems are used to remove unwanted hair. However, most lasers are specialized, and a specific laser with not work well for every skin type or hair color. Palomar Vectus Hair Removal is different. This is a revolutionary new method of hair removal that yields increasingly positive results. The process utilizes a Vectus Laser, to quickly remove hair with proven reliability. It works on high-volume, permanent hair removal on a vast range of hair and skin types, easily and comfortably. The Vectus laser features the most uniform beam profile, and largest spot size available in a laser hair removal system today. The Vectus enables practitioners to quickly treat the affected areas, even when those areas are large, and have sizable amounts of hair, such as the back. Treatments normally take less than five minutes. With other types of laser hair removal treatments, the practitioner must make multiple, painful passes over the client’s skin. In contrast, the Vectus uses sapphire treatment tips that contain an element called, “Advanced Contact Cooling,” This patented technology helps protect the client’s skin, and helps them to remain perfectly comfortable during the entire treatment. The uniform profile of the laser beam reduces the necessity for multiple, overlapping passes. Where can I get Vectus Laser treatments? 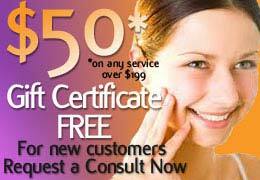 Most commonly, professionally-trained and licensed cosmetic physicians or practitioners administer Vectus treatments. One can safely expect any professional who is licensed to administer Radiesse filler, Botox Cosmetic or other non-invasive cosmetic treatments, to also have undergone laser hair removal training. The Palomar system uses pulses of concentrated light, similarly to that emitted by regular lasers, but that instead, uses a larger, smoother light beam and a longer pulse. This light is directed onto the affected areas of skin, and is absorbed by each hair follicle, which eventually dies and falls away. The treatment is fast, safe and comfortable. Does the treatment hurt at all? The Palomar system delivers light energy to the skin over a longer period of time than with regular lasers. This causes the pulsed light to be safer and more comfortable. Many people report a slight snapping feeling or spark, as the device is passed over the skin, but the sensation is not commonly described as one that is painful. How many treatments does it take to remove all the unwanted hair? Each person is different but typically it is around 6 treatments. The number of treatments necessary to remove all of the unwanted hair depends on the body part treated, and how much of the hair being treated is in its active growing phase. Your practitioner will be able to give you a more accurate assessment after examining the area that needs treatment.